Get ready to be inspired to create your own beautiful lamp. This post is sponsored by DecoArt. The project and opinions are 100% mine and always 100% true. Drawing inspiration from Jana Bek and Bunny Williams brushstroke lamps I knew this would be a fun project to take on myself. These ladies have created such stunning lamps and if it were in my budget I would love an original but it’s really out of the question for this girl. Plus, I love finding yard sale pieces and giving them a whole new life. No matter what I paint I consider it an art form. 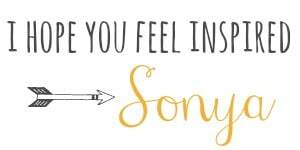 It’s something I think everyone who desires should definitely give it a try. 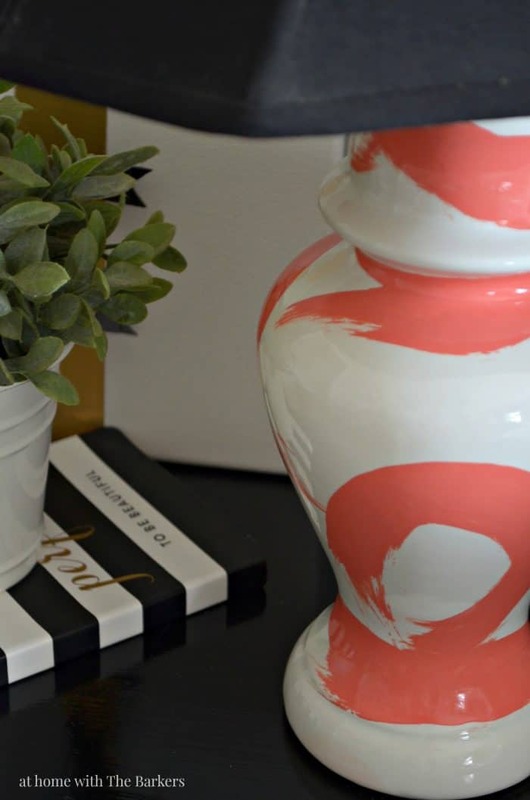 You have seen many painted pieces I’ve completed in the past using Americana Decor Chalky Finish Paint but this is my first time using the MAXX GlOSS™. 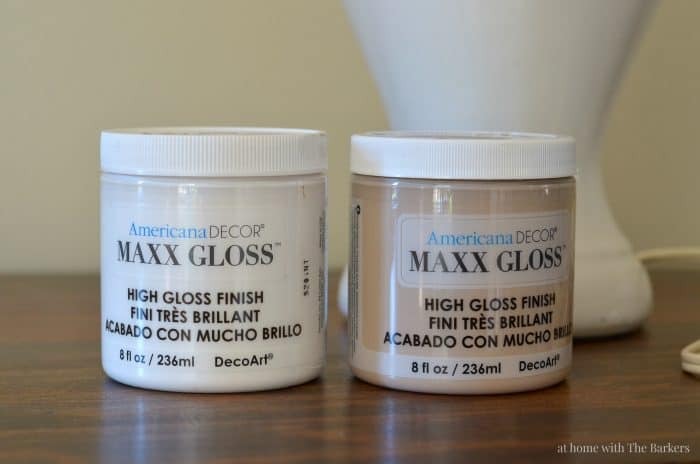 AMERICANA DECOR® MAXX GLOSS™ provides a revolutionary, superior, high-gloss sheen that delivers an almost lacquer-like finish. Until now, this level of gloss finish has only been available in aerosol spray paints. Aersols cause over-spray and must be used in a well-ventilated area for safety. 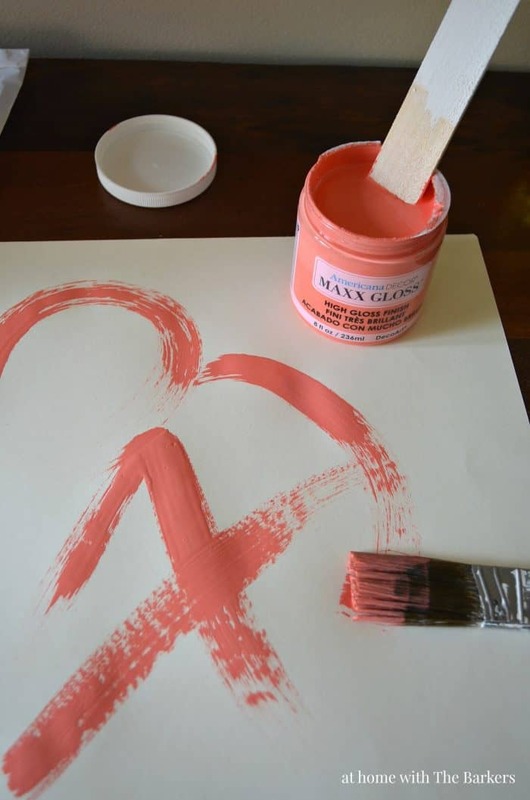 MAXX GLOSS™ now offers DIYers the ability to add a high-gloss finish with a water-based, non-toxic, brush-on formula. Perfect paint for my DIY brushstroke lamp. As you can see in the photo of the paints I had color options. The lamp came from a yard sale with lots of scuffs and marks. I had planned on painting the entire surface with the color white china. After cleaning the lamp it didn’t need a base color, all of the marks came off. I sampled a spot of the white china and it was the exact color of the lamp. I’m telling you this because more than likely you will find a lamp that will need a base color and the white china is a great option. I debated between going bold with juicy melon or low key with cappuccino. I decided the lamp was going in my daughters room so I let her choose. DUH, she said bold. The MAXX GLOSS™ comes in twenty colors that you can see HERE. You can purchase this paint from Michaels (in-store & online), Home Depot (select stores & online), Jo-Ann Fabric & Crafts Stores (in-store & online), and Meijer. I think looking at my completed lamp it’s obvious what I did to get the look. I thought it might be helpful to you to share tips that I learned while working on my lamp. Make slow steady brushstrokes when making your art. I practiced on a piece of paper just to get the feel of it. I tried going fast at first so I would get the brush drag but not enough paint was going on the lamp. I went slow and steady, then lifted the brush new the end of a line to get the stroke look. I had some small bubbles form as I was dragging. I corrected this by going back over those spots once more and they were gone. As the paint starts to dry it will become tacky. 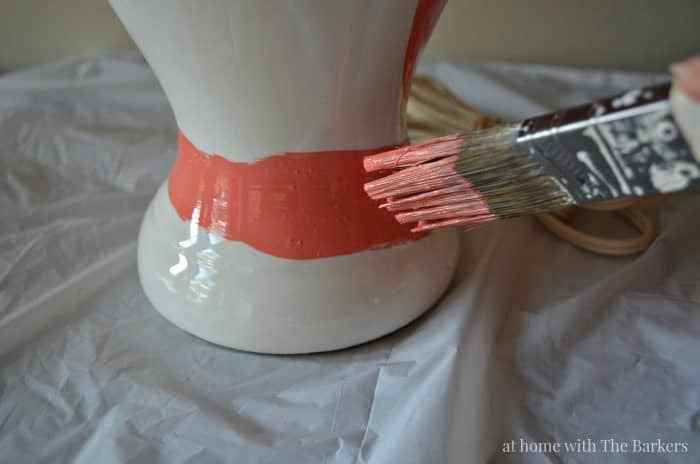 DO NOT drag your paint brush across the tacky paint, it will mess with your smooth level finish. Make sure your brush doesn’t have too much paint on it. You do not want ruins. If you make a mark you don’t like wipe away immediately with a wet napkin and start fresh. I LOVE how this one turned out! By the way, this lamp was $8!! Now go and paint something! Another AWESOME thrifted lamp makeover HERE! I was really happy with the color too. Wow Sonya! I love it!!! Looks great didn’t know they even had this kind of paint, you are talented and thanks. I found two smaller versions of your lamp at a jumble sale and NOW I know how to finish them off. I’d experimented with stencils (too curvy) wrapping with rope (cats, so not a good idea) and other stuff. That paint looks fun to use – great colors. It looks great Sonya! 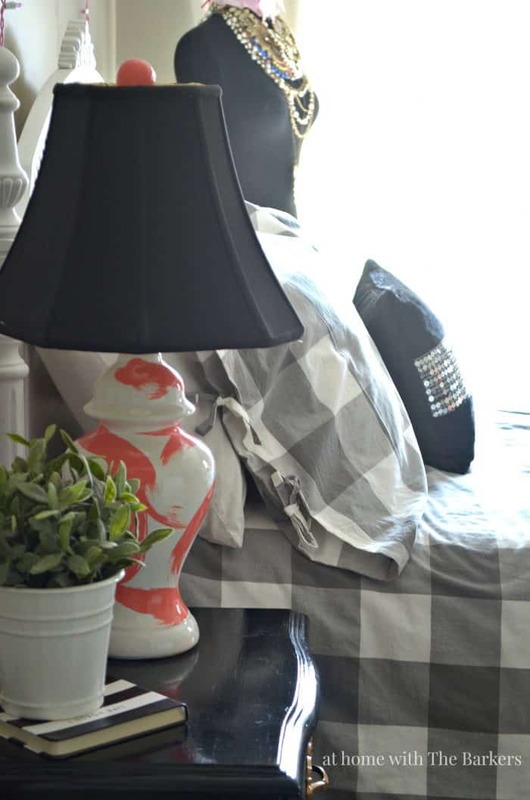 The color is so beautiful and it gives the lamp much needed oomph! Looks great. I love the color. It’s really a good idea to decorate the lamp. It’s so prominent in your room. Good morning! 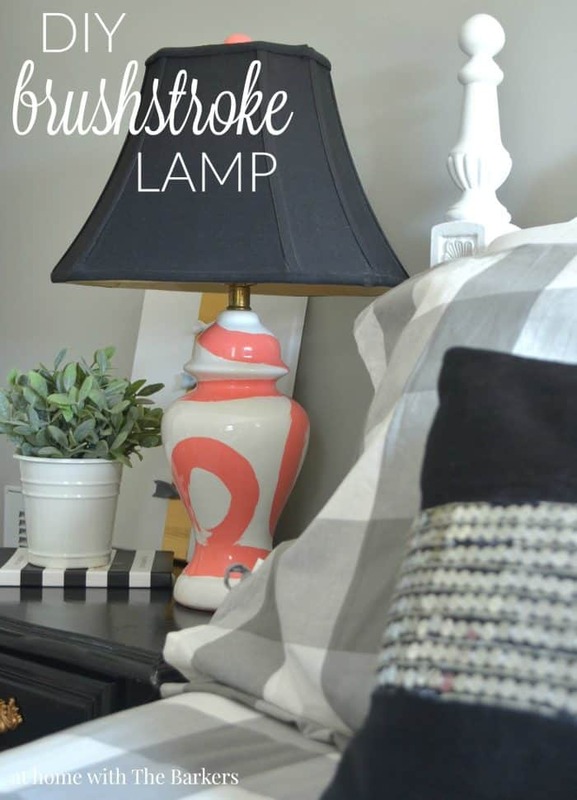 I recently shared your makeover in a round-up of lamp revamps and tutorials. I never knew you could paint lamps like this! Thanks for sharing your creativity!